We are living through a tectonic demographic shift pushing us further and further into a more renter-centric society, which started in earnest in 2011/12 and what we at ABI have coined ‘The Decade of the Renter.' I'll make no assertions whether this shift is good or bad, but make no mistake that it is happening. Based on Census estimates, at the National level, renter household levels have increased nearly 8% since 2000. More locally, the Phoenix MSA, as a whole, has witnessed a stunning 21% increase in renter households, impacting nearly 660,000 people, from 2000 through 2016. As the table below shows, this tectonic shift in the renter household population was led by Glendale, ~31% increase, Tempe, ~21% increase and Phoenix with ~20% increase. The absolute explosion of renter households, first as the result of the GFC (Great Financial Crisis) and now by preference, influencing both young and old, is but one facet of an overarching trend. Additionally, as home builders are more aware, is the changing face of new home owner expectations on the buy side of the housing equation, whether it's granite countertops, nickel hardware, hardwood flooring and the list goes on. This stems from multifamily developer/investor changes to the way they develop/remodel properties. In regards to new construction, developers delivered 1,630 units in the 1Q, a (9%) y-o-y contraction and significantly lower than the peak delivery witnessed in 1Q 2016's 2,803 units. Between 1Q 2015 and 1Q 2018, developers added just shy of 22,000 new units, despite increasing deliveries Phoenix's occupancy rate actually increased 1% to 94.9%. For 2018, developers are on track to deliver 9,000+ new units, the most since 2009's 9,315 unit delivery high. Although planned unit construction decreased (7%) y-o-y, to 13,829, q-o-q registered a 15% increase as developers gradually increased their purchases of land, led by a wave of Neo-Garden developers such as Christopher Todd Communities, NexMetro and BB Living. Phoenix is currently in the middle of a development type maturation, i.e. from one primarily focused on Garden-style to one more dominated by Mid-to-High Rise developments in urban areas. For context, at the end of 2015, the Phoenix Metro was home to 31 Mid-to-High Rise developments accounting for 7,772 units. 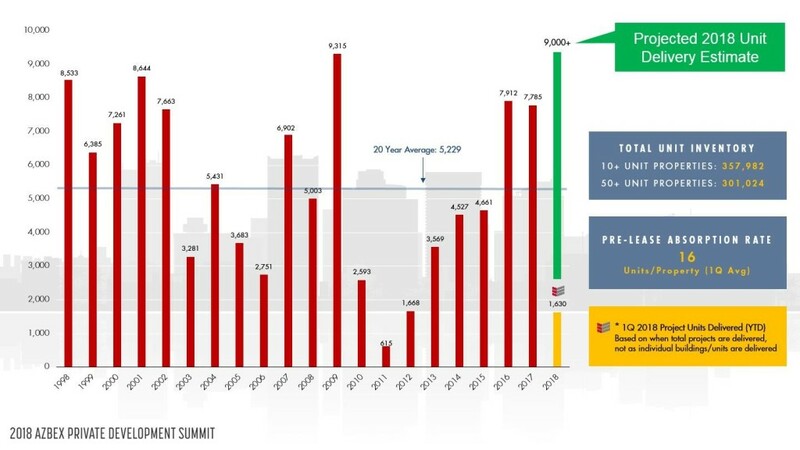 By the end of 2020, Phoenix's Mid-to-High Rise inventory will more than double adding 10,574 new units across 42 projects. 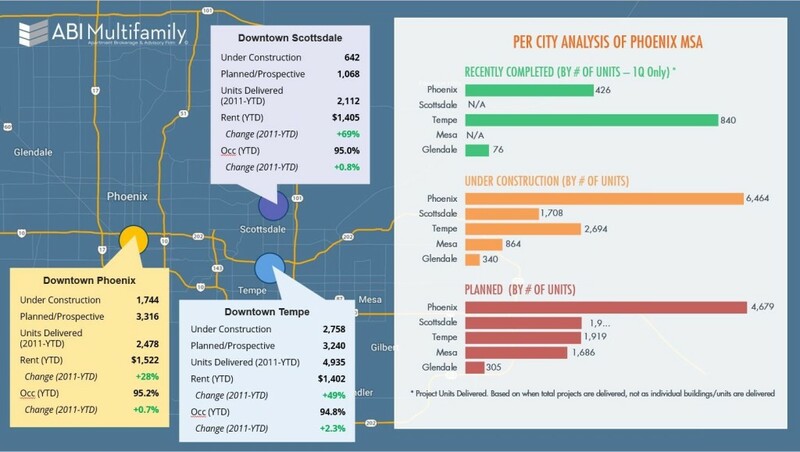 Looking at the map (below), much of the construction activity, at least what is reported in the paper, has focused on the Downtown Urban Core Districts of Phoenix, Tempe and Scottsdale. Downtown Tempe led the pack in sheer new unit deliveries seeing approximately 5,000 new units from 2011 thru YTD. Despite the elevated delivery levels, occupancy increased 2.3% with rents increasing an average of 6%+ per year. In fact, all areas experienced elevated construction levels and all have increased occupancy + witnessed sustained rental growth. For growing metros like Phoenix a 'healthy' occupancy rate is one between 94 to 96% where there's enough slack to accommodate growing population moving in and enough for current residents to be able to move fairly easily. It's akin to the single family home 3 month supply, market equilibrium rubric, i.e. too far below you get rapid appreciation in values (what Phoenix is currently seeing right now), too high above 3 months and prices falter, indicating there could be a potential correction on the horizon. Given that current pre-lease property absorption rates are 16 units/property per month suggests we're still in a very healthy market. How so you might ask? Well if you take the average number of units for all projects currently under construction in the Phoenix metro or 265 units per project, coupled with the pre-lease absorption rate, equates to a ~13 month delivery-to-stabilization period; considering that most developers use an 18-to-24 month stabilization period, we are still well below that, but above the 9 month period experienced in 2015/16, which correspondingly saw occupancy levels breach 96% with high rental rate growth. Given the amount of new supply scheduled for delivery the rest of 2018, I wouldn't be surprised if you see the metro flirting with 94%, perhaps 20 to 30 bps below to perhaps 93.7%, which if you're a renter, good deals could be had this summer, however as those properties stabilize the deals will go away towards the end of this year, beginning of next. Simple answer, no. The chart displayed shows multifamily housing demand v deliveries from 2010 to 2020. Given higher realized occupancy rates (trending towards 95%) and population growth (Maricopa #1 for growth in 2016, City of Phoenix 2nd fastest growing city in 2017 etc), Phoenix's new apartment unit deficit is expected to increase to ~32,000 by 2020. For the full unit demand methodology, including analysis of assumptions used, see Page 7, 8 of our Phoenix MSA 1Q 2018 Report.